This piece was commissioned by PRS for Music Foundation and first published on their website here. It was written by journalist Kate Molleson. Sarah Kenchington builds outlandish instruments at her home in the hills just north of Glasgow. 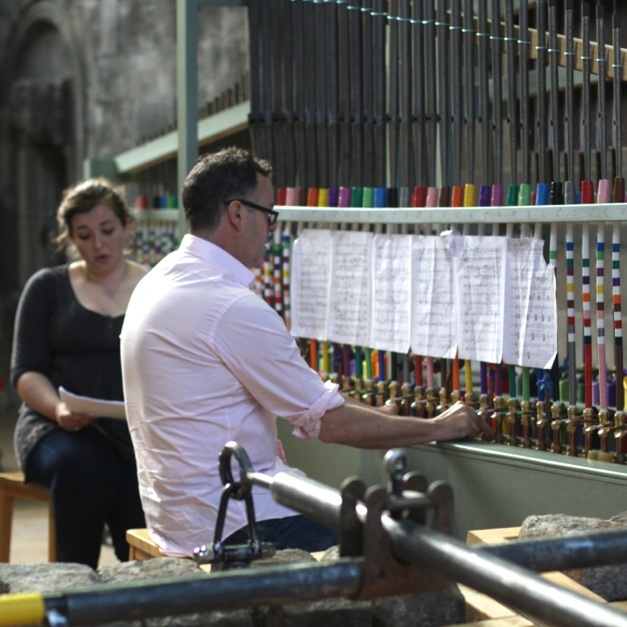 Her latest, Wind Pipes for Edinburgh commissioned by the Edinburgh Art Festival, is a wheezy pipe organ made out of leftover bellows and pipes,coded with bright primary colour ribbons. It’s designed to be played by everyone and anyone and is an enchanting thing: a huge, whimsical contraption that looks something between industrial steampunk and kindergarten playtime. The space it occupies is important, too. Trinity Apse began life as part of a 15th century Edinburgh church, but was demolished to make way for train lines in the 19th century and the stones relocated one-by-one to a new church up the road. That, too, was eventually knocked down and nowadays only the high vaulted apse remains. Tucked away down a narrow close just off the Royal Mile, it makes for a surprising sanctuary, especially during the throng and throttle of Edinburgh’s festival season. The place feels melancholy for its past glory, conspiratorial as a dislocated hidden gem. Wind Pipes fills the Apse almost entirely. The notion of space is integral to the instrument: the way that the organ’s sound resonates around the apse’s high ceiling, the sheer physicality that the vast instrument demands in order to make it puff. Kenchington’s materials include six sprawling sets of pipes, all salvaged from scrap yards and junk shops, with levers made out of bits of brass plumbing and two-pence pieces glued on as keys. Mighty bellows are balanced down with slabs of grey stone, each carefully chiselled to measure just the right weight. The pipes themselves are colour-coded with electrical tape so that those without musical training can figure out which notes to play (each pipe has a main colour to represent its note, then several others to show the note’s ‘friends’ – i.e. the ones that together make up a chord). The colours make the whole thing feel fun and friendly, and prompt a disarming choreography. Players swivel around finding notes and their friends like kids in a game of Twister. Kenchington talks of the Wind Pipes as an equaliser. A professional organist would be no better at playing it than a child, she says, and indeed the instrument seems to bring out the child in everyone who tries it. This is the first time that Kenchington has constructed an instrument to be played by anyone but herself, and she has made it accessible to all. As part of the New Music Plus…UK initiative, producer Suzy Glass commissioned a series of musical works to be performed on and around the Pipes. She cast her net deliberately wide, from composers Brian Irvine, Daniel Padden and Colin Broom to goofy improvisers Muris. The series of concerts culminates on a late-August evening with the Edinburgh-based collective eagleowl and friends: darlings of the Scottish low-fi indie scene, a self-described ‘lethargic pop band’ of ‘slowcore miserabilists’. The six lads arrive in the apse in contemplative mood, each roaming the space and tinkering with the organ before settling down to practice. Their piece is simple and spacious. They’ve called it Fourth Movement as a nod to the building’s long state of flux and the new lease of life that Kenchington has given the pipes. It begins with just voices: sparse counterpoint that stops and starts as if the singers themselves are being operated by some imaginary bellows. The counterpoint gradually grows into fully-fledged chords, then a sweet, tentative melody emerges from the tiniest pipes. One of the band picks up a pair of drum sticks and patters gently on the bellows. Feet begin to stomp and the music builds into an expansive anthem, six voices and six sets of pipes ringing warmly around the space. The performance sold out long in advance and the eager audience of 70-odd packs tightly onto benches made out of huge bass organ pipes. It’s an intimate, feel-good atmosphere, and there’s something deeply touching about seeing both the apse and the organ – a forgotten space and abandoned materials – come to life at the heart of it all. Glass talks about the possibility of taking Wind Pipes on the road and reassembling the instrument in other venues in other cities. Outside of the apse its character will shift, but who knows; maybe it can breathe new life into another once-forgotten space.